So each team is to have their own forum to think of ideas, which works for me. 👍 here's one for us. I'll be looking forward to working with the rest of you! The first game is thinking of a slogan. Now, I'm a huge Song of Ice and Fire geek and I love anoot of the "slogans" the noble families have- "Winter is Coming", "Family, Duty, Honor", "High as Honor", etc. I kind of like this, basically the qualities each family follows and tries to exemplify. What do you think the Classics generally believe in or stand for? To me: grace, kindness, inner strength. An actual statement would be great too. Does anyone have any ideas? Something like how they're regal as silk and strong as steel (example). Whoop! Whoop! 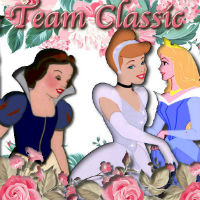 Team Classic! I'm so excited! Anyways, I think the classics stand for believing and dreaming, since Walt Disney was just really big on believing and dreaming and he definitely incorporated a lot of those values into the classic DPs. -well, it serves you right, spoiling the classics' dreams! -gentle is not weak, believe it or not, bibbidi bobbidi boo! -the classics are strong, believe it or not, bibbidi bobbed boo! - I suppose we're frightfully dull, and boring, and completely...completely wonderful. - That classics are seldom all they seem. But if...[add something here]..you'll love them at once. - a dream is a wish that is fairest of them all. - once upon a dream, with a smile and a song, bibbidi bobbed boo! - Strength soft as snow, steel strong as night, heart(s) that shame the red, red rose...Put em together and what have you got, bibbidi bobbidi boo! - That classics are seldom all they seem. Gentle as snow, lovely as the rose. Steel strong as a dream. - Sing sweet nightingale, will my song go winging? It will if you believe. that's all the ideas i could think of for now. the ones with asterisks are my favorites. I agree with disnerdtobe said. Another quote that I think is good from Cinderella to incorporate is "The dream that I wish will come true,"
@AudreyFreak, Disnerdtobe, BeastlySoul: Hello, guys, I was originally in your group for a short time, but got switched out. I really am delighted that Cruella has joined your group ( because that's what was asked in the poll). I'm being moved to another group. Good luck in the Princess Team Games!!! Sorry my last post (which has all the rough ideas, possible phrases we can use, and traits we want to include) got really messy and confusing, so I made this post which just has my favorite ones. - They can't order us to stop dreaming! - That visions are seldom all they seem. You know it's true, the classics are the dream team! - Remember you're the one that can make the dream that you wish come true. - strength of steel, hope of sunshine gold and hearts that shame the red, red rose...put them together and what have you got? Bibbidi, bobbidi boo! ^^I love that last one! Does everyone else like it or have a preference? ^ I like the last one too. I also like "they can't order us to stop dreaming", "frightfully dull" and "visions are seldom" too. I made "visions are seldom" to rhyme (sort of). strength of steel, hope of sunshine gold and hearts that shame the red, red ROSE...in ageless sleep she finds rePOSE. Bibbidi, bobbidi boo! I still kind of like it when it doesn't rhyme though. It makes more sense. OR strength of steel, hope of sunshine gold, and hearts that shame the red, red rose...with a smile and a song, she finds response...bibbidi bobbidi boo! OR strength of steel, hope of sunshine gold, and hearts that shame the red rose TOO. Put em together and what have you got, bibbidi bobbidi BOO! The dream that we wish will come true. For we have strength of steel, hope of sunshine gold, and a smile and song in our hearts that shame the red, red rose. Ok! How do we decide which slogan we want to go with? Strength of steel, hope of sunshine gold, heart that shame the red, red rose...put them together and what have you got? Bibbidi bobbidi boo! Strength of steel, hope of sunshine gold, heart that shame the red, red rose ~ the dream that we wish will come true. Personally I like the first one best. What do you guys think? And sorry for all the confusing posts/comments. Sometimes I'm not sure whether to make a new post or comment under the previous post. Hey guys, I'm probably going to bed soon, so should I put one of the slogans up (and which one should I submit or you guys fine with any of them)? Or if you guys prefer, one of you can put the slogan in the main forum. Just remember to get it in by the end of the day. So I posted the slogan on the main forum and going to bed. If u guys later decide to go with a different slogan instead, please feel free to post that slogan on the main forum and I will delete my old post tomorrow. Good night. Princesslullaby said she doesn’t think that our slogan can fit in the poll but she said we can make an icon of it. Should i shorten the slogan or does anyone want to make the icon? Idk how to make icons. Hmm, well, I like our slogan better. I don't know how to make icons either. ^oh sh*t I just saw princesslullaby’s comment. I was just second guessing myself on which slogan is the best. The first one sounds “clever” but the second sounds kind of more poetic and our shorter version was nice and simple. Can someone decide for me? Idk what to do. To me any variation that includes strength as steel, hope of sunshine gold and heart that shame the red, red rose is fine by me. I also can't do Photoshop. But do we have to MAKE icons? I have some in my laptop I've saved from tumblr. Hey guys, the next game is team icon. I can make the icon if you want. But I need to know do you all want one specific princess (if so which one) or all three in it? Personally I vote for all three since is the Classic team. Same. If we absolutely had to pick one I think Cinderella would do but I see no reason not to include all. I agree with all three princesses too. Here's the team icon. Let me know what you think of it. Do you want a different one, anything on it changed, or is it okay? Hey guys, looks like you're about to be the winners for the first round! Congratulations! Please come back to me with an idea for the 3rd round by tomorrow! Yay I'm so happy we won! So proud of us. What do we want to do for the next round? I've seen old articles of team lists for favorite Disney princesses. I've never played team games before so idk what games people usually play. Awesome! I'm glad we won! Here's a link to one of the old team forums hopefully that can give us some ideas. Personally I think some kind of collage that represents them would be a good challenge. It can either have screencaps from their movies or be an Aesthetic college with photos represent them. hey guys, I'm gonna need a category pretty soon! one of you can take the initiative and just email me a suggestion just in case you can't all decide on one. thank you! So how shall we do this collage? Hey team mates, I wanted to say that if everybody would prefer to keep the games as 3 teams I don’t mind moving to Team Revial. It would cut the Team Classic down to 3 members but at least we be able to keep all three teams. Not to sound dishearting, but this is a pain to think about. Okay, Princesslullaby moved to Revival to even things out, so there will be no combining of the Teams. Now that, that’s settled we need to discuss our collage. Like I said, when I messaged Princesslullaby I decided on colleges of things that represent the DPs. 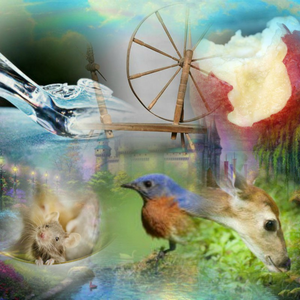 Here’s what I said: each team makes a collage with images of things the represent the princesses in their group, (ex. Tiana and a frog, Cinderella and a glass slipper) but they can't use images of the actual princesses. I apologize if I made it to complicated but she wanted one us to give the next round ASAP and no one else was online at the time. 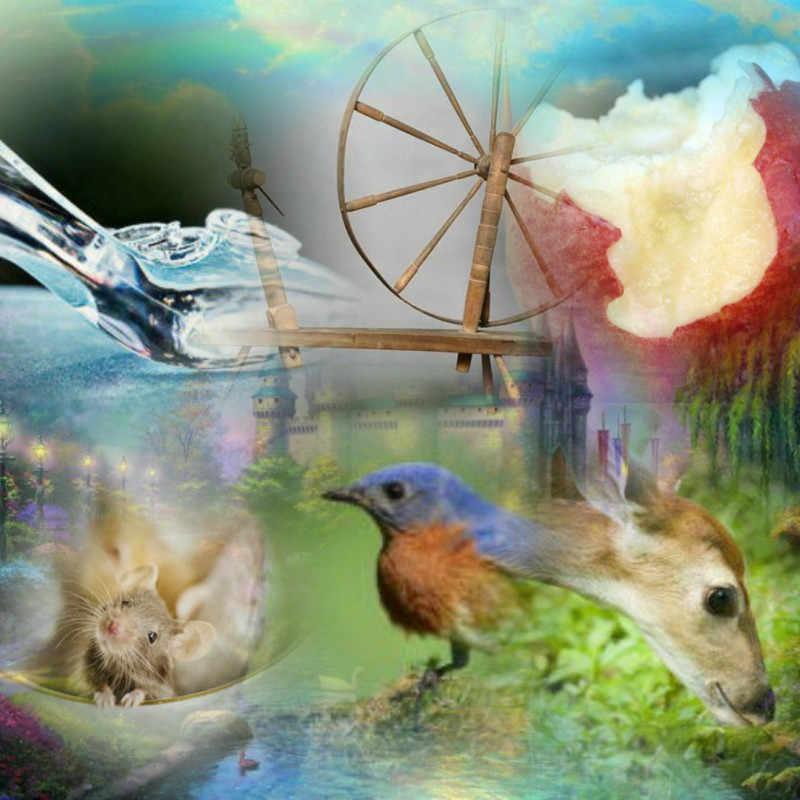 But I’m thinking Cinderella and Glass slipper, Snow White and Apple, Aurora and Spinning wheel, plus images of the kinds of animals they’re friends with, and on a castle background. Let me know your ideas. 1. It must only be with characters from your team's era, and it must have at least ONE princess from your era. The other character(s) can be any other character from that era, but at least one princess. 2. It has to be an action scene as if they are in a movie together; they must be performing an action. It can't just be Pocahontas and Jasmine photoshopped into a picture together without any interaction. 3. Minimum two characters, but you can do any amount that you want. I may have one. 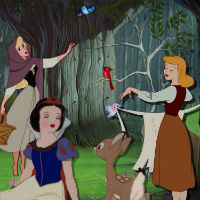 Both Aurora and Snow White were involved with singing around animals in the forest. Reminder that the crossover icon is due today! Round 5: Perfect Quote- a quote from other media (non DP-related like movies, books, etc) which represent any princess from your era or all the princesses from the group. Hope you all understand! It’s a beautiful song. Here’s the link. We don’t have to use the entire quote, just part of it is fine too. Again we don’t have to use all of it. We can just use part of the lyrics. REMINDER TO ALL TEAMS THAT THE QUOTE IS DUE TODAY! DRESS SWAP IS DUE TODAY...but neither renaissance nor classic seem to have made one. members of the teams, contact me when you can. 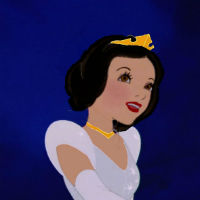 Here it is: Snow White in Cinderella's dress wearing Aurora's crown and necklace. Hey guys, you've won the last round!! please tell me asap a new game :) thanks! Sweet we won again :D so what game do we want to play next? Do we still want to do something art related because I don’t really know how to do art stuff or icons really. I remember looking through past games there was a baby face. 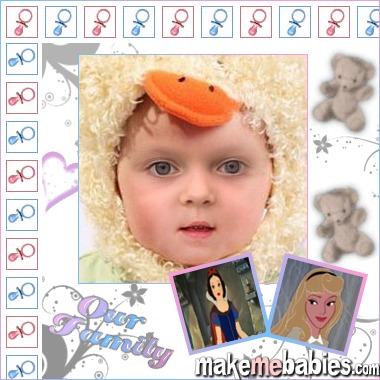 Like you go on some website, and mash Snow White and Cinderella and auroras face together to see what they would look like if they had a baby. Um that’s all I can really think of off the top of my head right now.